Review the status of your uptime checks. Get a list of IP addresses used by uptime checks. 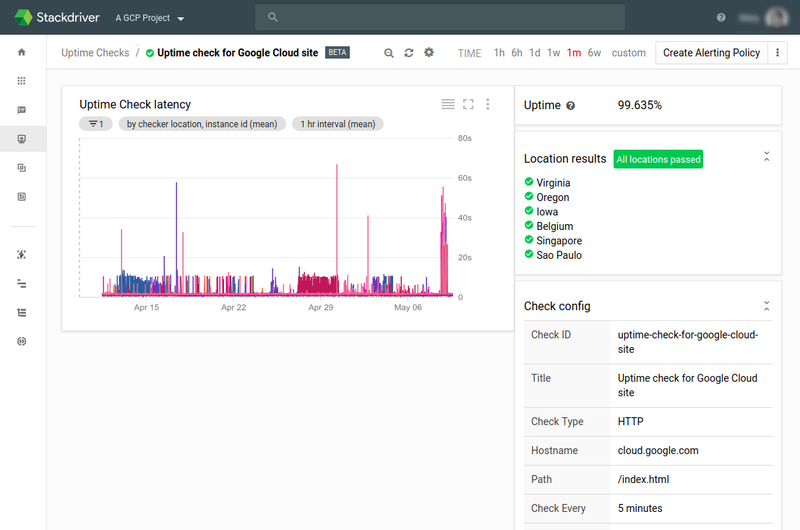 To create, update, and delete your uptime checks, see the Managing Uptime Checks page. You can have up to 100 uptime checks per Workspace. Note: If the resource you are checking is not publicly available, you must configure the resource's firewall to permit incoming traffic from the uptime-check servers. See Getting IP addresses to download a list of the IP addresses. Monitoring has an overview page that displays all your uptime checks, and detailed dashboards for individual checks. Note: It is normal for the dashboard to report "no data available" for newly-created uptime checks. This message goes away when the data arrives. The maximum wait time for this stage is 25 minutes. The Location results region shows the results of the uptime check in all the applicable regions. A green dot next to a region indicates the last run of the check in that region succeeded; a red dot indicates failure. Moving your mouse over the dot displays the latency of the last run as well as the HTTP response code if applicable. The Check config region includes a description of the uptime check, including the Check ID. This ID is assigned when the uptime check is created. The value corresponds to the [UPTIME_CHECK_ID] value in API calls. To retrieve your existing uptime check configurations, use projects.uptimeCheckConfigs.list. In the API, uptime checks are identified by their [UPTIME_CHECK_ID], which is a respelling of the uptime check's display name. For example, the display name "my uptime check" might become the ID "my-uptime-check", or the mapping might be more complicated. You assign the display name that you see in the Uptime Overview in the Stackdriver Monitoring console. The Uptime value is a percentage calculated as (S/T)*100, where S is the number of successful check responses and T is the total number of check responses, from all locations. For group checks, the values of S and T are summed across all current group members. For example, over a 25 minute period, an uptime check with a one-minute period running from all regions would get 25 requests from each of 6 locations, for a total of 150 requests. If the dashboard reports an 83.3% uptime, that means 25 of 150 requests failed. 1. Go to the Uptime Checks page for your project. Call the uptimeCheckIps.list method of the Monitoring API. The region: USA, EUROPE, SOUTH_AMERICA, or ASIA_PACIFIC. A more specific location within the region. The IP address, not a range, in IPv4 or IPv6 format. // listIPs is an example of listing uptime check IPs. # Iterate over all results. The returned information typically contains about 20 IP addresses. Uptime checks can come from any of the IP addresses, but only one address from each geographic location is used for each time interval. The geographic locations are listed in the uptime checks dashboard, shown in the previous section. You can also use free, web-based services to identify the registered locations of the IP addresses you downloaded. The IP addresses used by uptime checking might change, but typically not more than once per quarter and not without an announcement. ip: The ip field contains one of the addresses used by the uptime-check servers. See Getting IP addresses. Specifying a User-Agent custom header results in a form validation error and prevents the check configuration from being saved.